Luxembourg uses SeaSafe, an advanced vessel screening software, to strengthen regulatory oversight of its fleet and mitigate PSC detention risks, at no extra cost to Owners and Operators. This proactive approach helps ensure Luxembourg-flagged vessels are properly prepared for their upcoming port calls and increases the likelihood of a positive outcome in the event of a PSC inspection. SeaSafe also promotes Owner and Operator awareness of ongoing PSC Concentrated Inspection Campaigns, new regulatory requirements and recent PSC detention patterns. SeaSafe’s vessel screening process has contributed to Luxembourg’s improved PSC performance, reducing detention and deficiency rates in Australia, China, Europe and the United States. SeaSafe uses LRIT vessel-positioning data to identify Luxembourg vessels entering designated notification zones linked to the major regional Port State Control MOUs. Upon entry, SeaSafe automatically sends a Pre-Arrival Checklist (PAC) to the vessel’s Designated Person Ashore (DPA) to be completed by the vessel’s crew. PACs detail the most common deficiencies items identified during recent PSC inspections. SeaSafe’s risk analysis algorithm automatically analyzes the vessel’s data, including the information provided in the PAC, to determine the probability of a PSC boarding at the next port of call. Factors considered in establishing the vessel’s risk profile include ship type, age, inspection history, last flag state inspection as well as the next port of call. preemptive reporting of any identified concerns to Port State authorities. Owners may also request the attendance of a Flag State Inspector at any time on short notice. The Luxembourg Maritime Administration promotes quality shipping through annual Flag State Inspections (FSIs). FSIs monitor and verify regulatory compliance of Luxembourg vessels with international, European and national rules and regulations. The FSI program covers all ships registered in the Luxembourg Ship Registry. The inspection scope includes certificate and document control, followed by a systematic sampling of the ship’s general condition, safety management and security systems, work on board, emergency preparedness, pollution prevention measures and crew accommodation. Luxembourg boasts a network of 400+ flag state inspectors in ports around the world. Inspections can be scheduled at a convenient time and location, significantly mitigating any inspector travel costs. Luxembourg Flag State Inspectors are available on ad hoc basis at shipowners’ request. Port State Control (PSC) inspections of foreign ships in national ports complement Flag State oversight. They serve as an important verification tool for regional PSC Memoranda of Understanding (MoUs) seeking to eliminate sub-standard ships. PSC inspections ensure ships meet international safety, security and environmental standards and that crew members benefit from adequate living and working conditions. Diligent ship maintenance and operation are paramount for avoiding issues with PSC authorities. The Paris MoU uses a risk-based inspection methodology to identify ships due for inspection. Ship-specific risk profiles determine inspection priority, intervals and scope. Several parameters, including the ship’s flag, are assessed daily to designate a vessel as high, standard or low risk. Low Risk Ships (LRS) are ships which meet the criteria of the Low Risk Parameters and have had at least 1 Paris MoU PSC inspection in the previous 36 months. A white-listed flag is a Low Risk Parameter. The Paris MoU publishes an annual flag State performance document (Black, Grey and Whited flags), based on the inspection and detention history over the preceding three calendar years. The Luxembourg ships are considered LRS for Paris MoU flag state parameters. The Luxembourg fleet boasts one of the lowest detention rates and deficiency ratios among EU Member States. Tokyo MoU uses a similar risk-based inspection methodology to identify ships due for inspection. 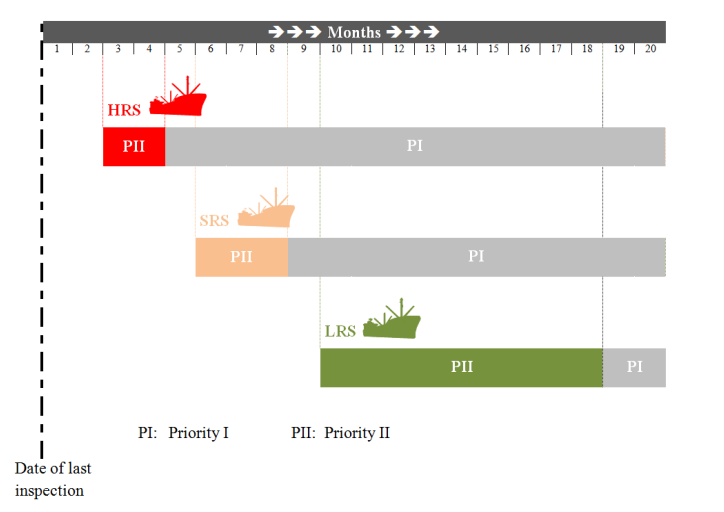 Ship-specific risk profiles determine inspection priority, intervals and scope. Several parameters, including the ship’s flag, are assessed daily to designate a vessel as high, standard or low risk. Low Risk Ships (LRS) are ships which meet the criteria of the Low Risk Parameters and have had at least 1 Tokyo MoU PSC inspection in the previous 36 months. A white-listed flag is a criterion of the Low Risk Parameters. Tokyo MoU annually establishes a Black, Grey and White list for flag State performance, based on inspection and detention history over the preceding three calendar years. Luxembourg vessels are considered “Low Risk Ships” for Tokyo MoU flag state parameters. The USCG targets poor-quality vessels and rewards owners and operators of high-quality ships through its Qualship 21 Program. not registered with a Flag State that has a detention ratio exceeding 1.0%. The vessel’s Flag State must have at least 10 distinct arrivals in each of the previous 3 years. Qualship 21 tank ships are examined annually but benefit from a reduced-scope mid-period examination. Since 2011, the USCG has maintained a list of Flag Administrations that have demonstrated a commitment to excellence in their level of compliance with international standards but do not meet the full requirements for Qualship 21 eligibility. Luxembourg’s commitment to excellence has been recognized by the USCG with no ship detentions in the previous three years. The Master must receive a copy of the PSC inspection report from PSC authorities and promptly communicate it to the Luxembourg Administration. following an additional inspector-requested ISM Code audit. In case of serious deficiencies, the Port State Control Officer (PSCO) may decide to detain a ship until their rectification. A notice of detention is issued to the Master, the Flag State Administration and the Classification Society. The Master should promptly notify the Luxembourg Administration of the detention. Once satisfied with the corrective actions, the Master can apply to the PSC for re-inspection. Detentions may be appealed by the Master or Company. For urgent PSC issues, please contact the Duty Officer.